OATP1B1/OATP1B3 (Organic Anion Transporter Protein B1 and B3) are uptake transporters involved in the transport and disposition of endogenous and exogenous compounds. Expressed exclusively on the sinusoidal side of hepatocytes, these transporters are responsible for the uptake of endogenous and exogenous compounds from circulation into the liver. Drugs that are inhibitors of OATP1B1 /B3 may fall liable to drug-drug interactions (DDI) as these transporters are involved in the transport of many drug classes, notably statins. Sygnature’s OATP assays measure the uptake of the substrate estradiol 17β-D-glucuronide into ready-plated HEK293 cells expressing the transporter. The substrate and a range of test compound concentrations are added to the cells. 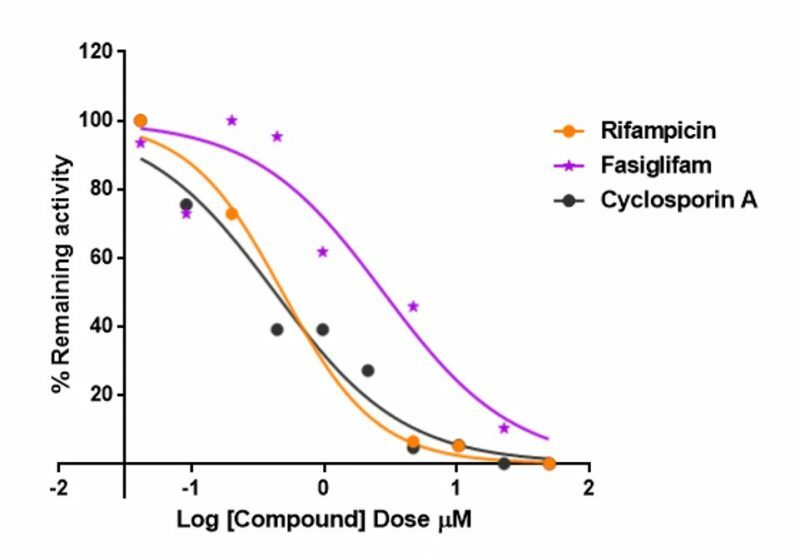 Rifampycin is used as the model inhibitor for both isoforms along with gemfibrozil, erythromycin as specific OATP1B1 inhibitors or ritanovir, methotrexate as specific OATP1B3 inhibitors. Figure 1. Inhibition of estradiol 17β-D-glucuronide uptake into ready plated HEK293 cells expressing human OATP1B1 or OATP1B3 transporter by a number of Known inhibitors.